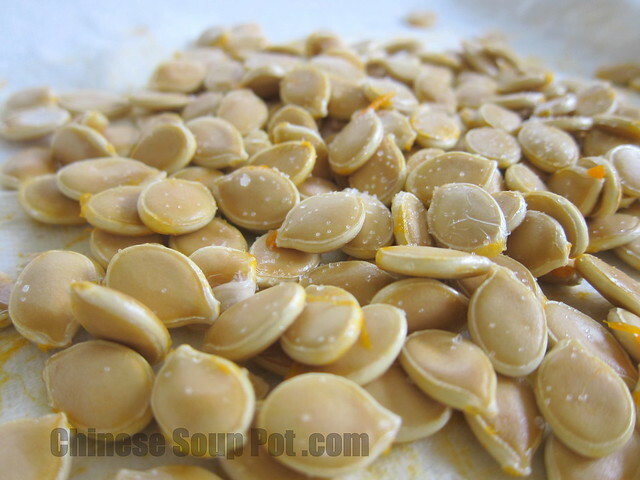 Making your own homemade pumpkin seeds is very easy. 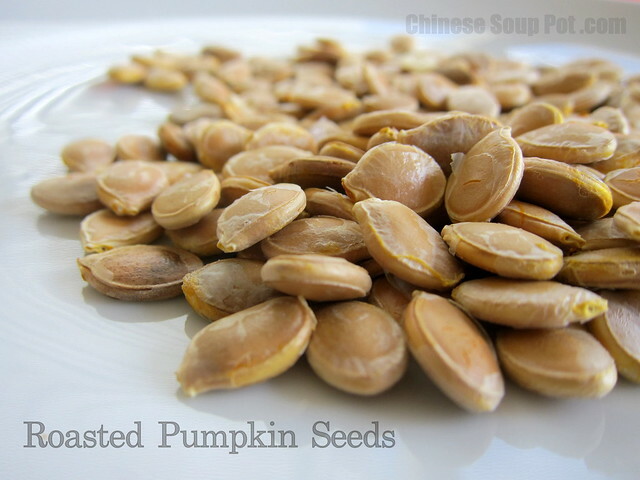 First, open up the pumpkin and scoop out the seeds (also called pepitas). 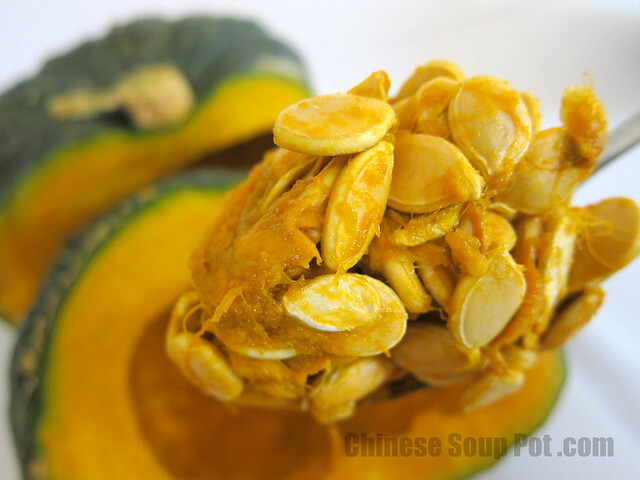 In my case, I am scooping out seeds from a very ripe kabocha pumpkin that will be used in a sweet savory squash soup (soup recipe to come soon… :>). After scooping out all of the seeds from the pumpkin, use your hands to pull the meaty seeds off of the stringy pumpkin fibers. 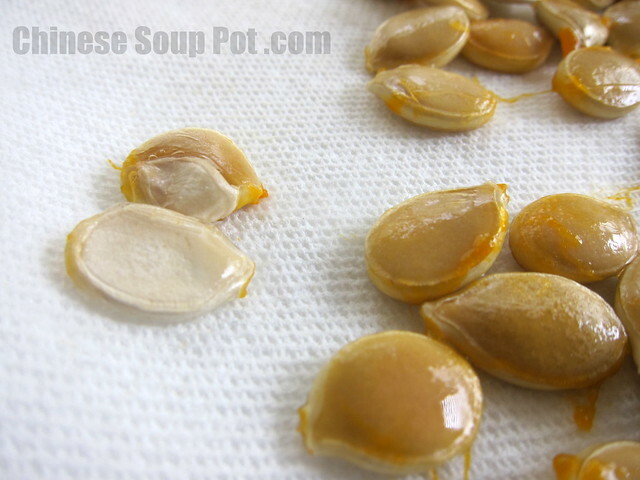 Then, rinse the seeds in water and pull off any remaining pumpkin fibers still sticking to the seeds. Be careful in this step as the seeds become a little more slippery when they get wet. Comb through and pull out any bad or flattened seeds (like the ones in the photo below) from the pile. The plump meaty seeds are the ones we will bake later on. Pat dry the seeds with a clean towel. Spread out the seeds on a flat oven pan and gently sprinkle some salt or other seasonings you like. For me, I like my roasted pumpkin seeds flavored with just a little bit of salt. 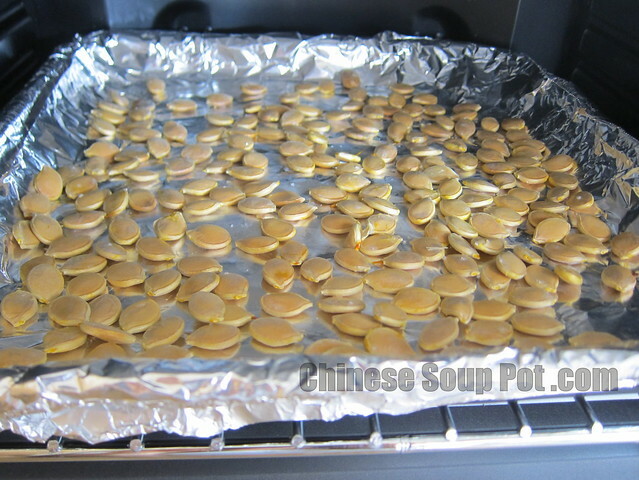 When the oven is ready, bake the seeds for 15 – 20 minutes. Depending on your oven, you may need to adjust the temperature or timing to make sure the seeds do not burn. When that is done, you have yourself some tasty healthy homemade baked pumpkin seeds that provide nutritious minerals. Enjoy! I love roasted pumpkin seeds! They were always my favorite part about carving pumpkins when I was a kid. What a wonderful healthy snack recipe! This would probably the only part I like about the pumpkin (I’m one of those rare people who dislike it). Thank you for sharing! This is a very informative topic. I didn’t even care about these seeds until now that you gave me an idea. Well, this coming Halloween, I will remember this post to roast them. Thank you, Sharon and have a good weekend! I love pumpkin seeds (my favorite seeds!) but have never roasted them myself … I’ll try! My husband eats pumpkin seeds! I’m not much of a seed eater (is there any word like that? ), but I bet he’ll enjoy these! I’ve always ended up wasting those seeds because I don’t know the right technique to roast them. Thanks for the recipe! I just found and am loving your blog! I am currently sipping the water in which I boiled/simmered an asian pear, in order to help me overcome a cough I seemed to have developed a few days ago. I see that you have quite a few recipes for asian pears – exciting! 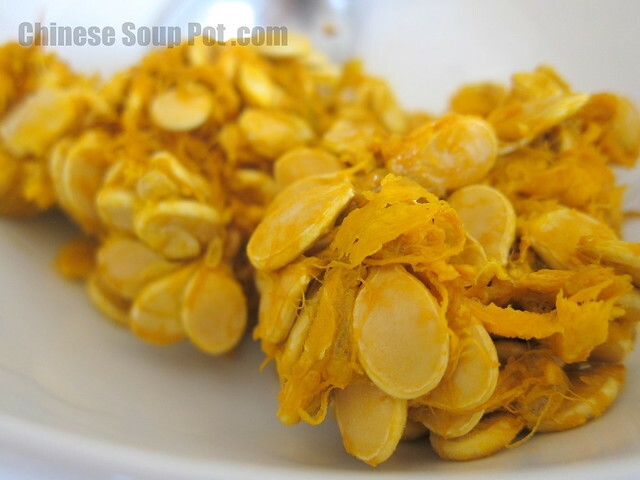 About pumpkin (or squash) seeds: have you ever had or heard of people having any digestive distress eating pumpkin seeds? I seem to experience some, unless I pre-soak them overnight. Any input on that? I hope the pear soup is helping with your cough! About the pumpkin seeds, I have not had digestive issues eating pumpkin seeds. And I have not heard of others having that issue before either. I would recommend getting the advice of your doctor if you have digestive distress eating certain foods. Everyone’s body is made different, so it may be a good idea to check with a physician. If you find that pre-soaking the seeds helps, please report back! I think readers would appreciate knowing that too. Thanks Randa and I hope you feel better! It does seem to work for me… hope it helps!